At the Natural Products Expo West in Anaheim last week, lots of gluten-free folks stopped by our booth and tasted our Glutenetto cookies. “How do you get them to taste like the real thing?” they asked. It takes a lot of love and a lot of hard work! Here’s the long and short of it. I am Italian! So when I had to give up gluten and dairy, I also had to give up so many food traditions and memories … [Fernanda of Cookies con Amore and I] talked awhile and she gave me two types of Gluten-Free cookies—Pignoli and Ricciarelli. I carefully put them in my bag and took them home. I knew if they were as good as they looked, I wanted to enjoy every bite in the peace and quiet of my home. They were even better then I could have possibly imagined. They melted in my mouth, bursting with memories and flavors I have not had in years. Our objective is to make our Glutenetto cookies taste so good that you won’t miss the wheat. 1. Some of our recipes are naturally gluten-free. Wheat was never a part of the batter for some of our most favorite and traditional Italian cookies. Our Amaretti, Pignoli and Ricciarelli recipes are based on eggs and butter; they are gluten-free without any need for modification. Of course, these cookies need to be baked in a gluten-free certified facility so that there’s no cross-contamination. That’s why we got certified by the Gluten-Free Certification Organization. 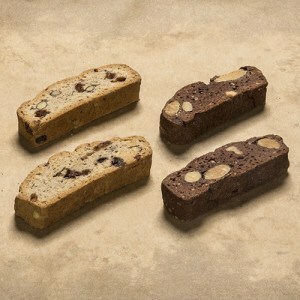 We chose Biscotti for our first gluten-free cookie adaptation. The secret to a good Biscotti is a crunchy and crumbly texture. The cookie should hold together when you dunk it in coffee, but still be edible if you eat without dunking. To produce our signature crunchy, crumbly Biscotti texture, we had to experiment with various combinations of gluten-free flours. In general, we also found that gluten-free dough is more temperamental than wheat based dough and we need to make adjustments to cooking temperature and time to yield the right combination of crunch and crumble. It was a challenge, but we won’t offer a gluten-free version of any cookie unless we can get the texture and flavor just right. We’ll test and try again until it tastes good enough to evoke memories of home. 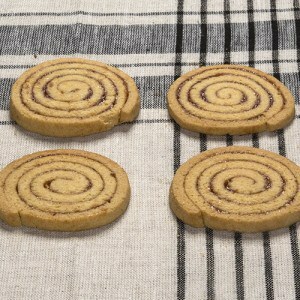 The Polentine is a crispy cookie made with polenta (corn flour) and rolled with raspberry jam. Although it’s a traditional Tuscan cookie, it’s not made in the traditional way. We created the recipe from scratch to be gluten-free. Because the Polentine is only slightly sweet, it pairs well with a bit of goat cheese and prosciutto. It has become one of our favorites and best sellers. It wasn’t enough to make gluten-free versions of our cookies. We also felt strongly that we needed our baking facility to be certified gluten-free by the GFCO. It’s a rigorous process that includes annual inspections, regular product testing and continuous ingredient reviews. We’re happy to do it so that everyone can enjoy our cookies! 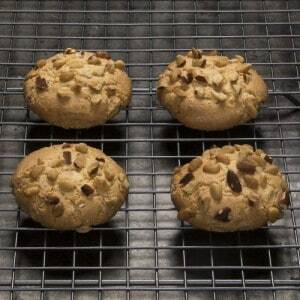 Have Questions or Ideas about our Glutenneto cookies? We’d love to discuss in the comments below! can you please tell me where I can purchase your cookies, especially “noonie” they are wonderful. Can you share any recipes ? Thanks in advance for your assistance.